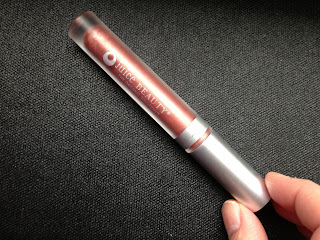 THE SKINNY: Juice Beauty's Reflecting Gloss is really shiny lip gloss. It's almost too shiny, but I think you can get away with it more in summer. My sample from a recent Ipsy bag is in the color "champagne," a basic neutral. It looks good against my fair skin when I'm wearing bronzer and summer hues. It might look a little silly in winter. The thing I like best about this gloss is how it makes my lips feel. It's made with antioxidant-rich berries, minerals and sweet agave, which creates a very soothing lip product. But it is a gloss, so the color doesn't last that long. KEEP OR TOSS: Keep. This is one of the first Juice Beauty products I've enjoyed. CHECK IT OUT: Reflecting Gloss comes in four shades: Champagne, pink, fig and guava.